Municipalities debated for many years over the pros and cons of setting up a recycling program for their residents. Some argued that recycling used more energy than it saved, while others argued against mandatory recycling programs. However, there are many advantages of municipal recycling, the most obvious would be environmental. The amount of landfill waste that is collected each year in the State of Massachusetts is staggering. 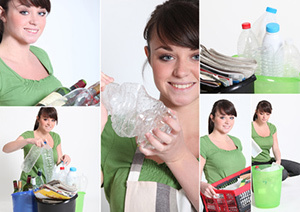 While it might be easier to just toss that old aluminum can in the trash or put used glass bottles into the bin, the few minutes that it takes to sort your trash each week can amount up to big savings where it matters most. More than any other type of recycling program, municipal recycling in Massachusetts has helped to reduce pollution and the amount of raw, virgin materials required in manufacturing and other industries. Other advantages of municipal recycling include decreasing the sheer volume of waste that ends up in our local landfills and ultimately the cost associated with curb-side garbage pick-up and disposal. If your municipality is considering starting a recycling program, check out the custom municipal recycling and scrap management programs available through Mid City Scrap Iron & Salvage in Westport. They service a wide variety of municipalities, specifically tailoring each program to provide the best possible results for both the environment and the consumer. Mid City works with small towns, large cities, counties and even state government agencies, providing services that will work to improve recycling efforts and boost revenue generating opportunities. Each custom municipal recycling program developed by Mid City is designed to promote the health and safety of the community that it serves. In addition to increasing revenue for the municipality, the other advantages of municipal recycling include achieving targeted goals for sustainability, environmental improvement and adherence to national industry standards. Mid City guarantees performance satisfaction to every customer it serves, providing a wide variety of additional services and programs to further customize the results. Some of the additional options and services provided by the custom municipal recycling programs available at Mid City include appliance recycling for both CFC and HCFC appliances as well as scrap metal recycling center services for electronic product scrap. Audits for scrap and recycling programs can be provided for the collection and transportation of all materials. Mid City offers additional services for municipal recycling in Massachusetts such as mobile bailing and shearing, scrap management services and processing of scrap metal and materials. Mid City can also provide public drop-off facilities, roll-off container services, non-ferrous and ferrous metal recycling and other custom municipal recycling programs. Our experienced staff will meet with you at your site to discuss all of the options available to you, as well as information about our scrap metal recycling center and all of the advantages of municipal recycling. Our consultants can suggest additional recycling options, provide innovative ideas for reducing solid waste costs and offer a variety of other cost-effective opportunities. After touring your property and gathering information about your goals, budget and specific requirements, our consultants will develop a comprehensive and sustainable custom municipal recycling program that works to maximize your recycling efforts, while boosting revenue and minimizing costs. In short, we develop a unique plan for each and every municipality we serve, providing a beneficial solution that will be profitable to everyone that participates. Studies have shown that the advantages of municipal recycling increase over time as the participants become more experienced in the options and programs available. In other words, the benefits may start slow, but they will get bigger and better as you, your team and the residents in your municipality embrace and use all of the resources. National studies have also revealed that, when managed effectively, most municipal recycling programs will cost cities less than curb-side garbage disposal. As more and more residents take advantage of the custom municipal recycling program, the amount of curb-side garbage will decrease and the amount of recycling materials collected will increase. This will substantially reduce the amount of garbage that ends up in the local landfill. Contact Mid City Scrap Iron & Salvage for more information about starting a municipal recycling program in Massachusetts. Set an appointment with one of our professional consultants for an overview of the options and opportunities available through our custom municipal recycling programs and to learn more about the advantages of municipal recycling.